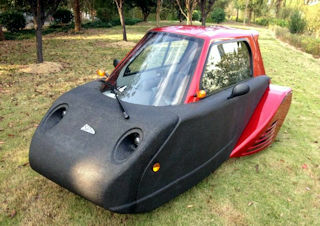 The exterior of the car is made from expanded polypropylene foam over a fiberglass honeycomb and has an enclosed cabin for just the driver. Whilst braking and accelerating were done with traditional floor pedals, steering was a bit more unusual in that it was done via 2 grips of an inverted-V-shaped handlebar. Weighing just 236kg, it is planned that the Spira4U will be available as an electric vehicle using a 10-kW motor and 72-amp battery pack or as a petrol version fitted with a 150cc Chinese Wangye motorcycle engine. As of 2018 the vehicle appears to be in limited production in China as the company seek global/ local suppliers, dealers and manufacturers to produce the car.